"Our goal is to have a great comeback next season"
Team Merging Edges comes from Santa Catarina, a city in the state of Nuevo León, Mexico. The climate is hot the whole year. Representing Mexico at Worlds in 2016, Team Merging Edge is preparing for their come back next season. The team is training between 10 to 16 a week plus weekend camps but has difficulties to participate in a lot of competitions due to the costs of the travel. Interview. Team Merging Edge is the Mexican Synchronized Skating Team. 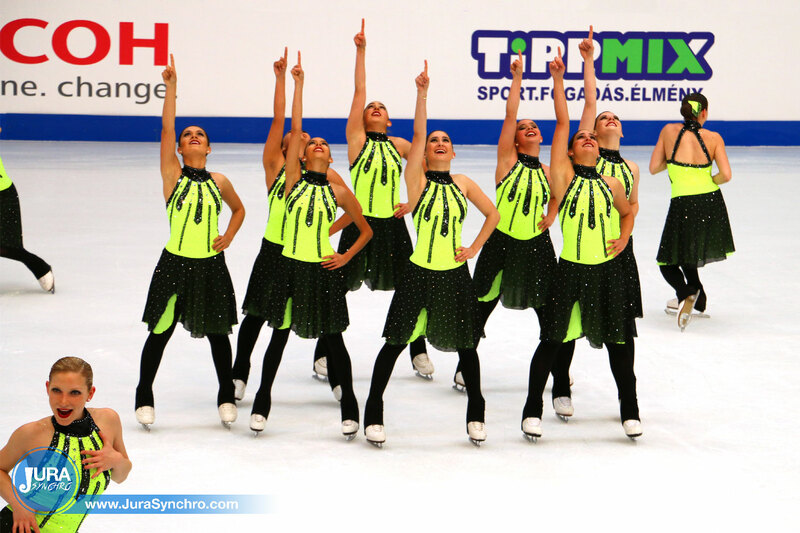 They compete in Senior and University and is training at Ice Complex in Santa Catarina NL, México. Who are the coaches of Merging Edge? Ana C. Cantú Félix (coach and one of the skaters): Michele Cantú Félix (my sister), Donna Mitchell (our amazing coach from the USA) and just recently added to the coaching team Alex García, one of our old teammates. How many skaters are part of the team? Oh, difficult question... on and off about 20 to 30 people have overall skated at our team. We have new skaters starting for these seasons. It is difficult coming from a smaller skating nation to have a stable 20+ skaters team. Mexicans are loud and artistic and we try to make our skating the same as our culture. How many hours per week does your team train? We usually do 10 to 16 plus weekend camps here and there! How did your team has been created? The first time we heard "synchro could make the Olympics in some years," while in a trip in Greece (exact location Stadium of Olympia), we thought, we could do this! So Michele and I started a team... contacted anyone we could to inquiry and figure out if what we were reading meant what we were doing until I heard someone who skated with us for years in Connecticut was now in the Haydenettes' senior team and so, I call her. I thought maybe she could help me figure out some elements... she referred me to Donna Mitchell, and the next was history! Your team is unique... Tell us why! Because Mexicans are too! We are loud and artistic and we try to make our skating the same as our culture! How is synchronized skating developed in your country? It is not. I always feel I'm running against the tide. Getting this sport into the Olympics would definitely change our Mexican-Synchro-World. Single skating... that's what started the team and it is still one of the best things in it! And what are the points you still need to work on? Synchro elements! It sounds funny but it is true, as hard as it is to start a team here, we get novice, junior and senior skaters to pretty-please-just-try-it-once and they challenge of going together and executing just side-by-side elements gets them going... sometimes they think it is harder than a double jump! What are the important things for you to work during the summer? What we do, is get together to work on skills and edges, twizzles and synchronizing them to make August easier on us. Cherish having a National system of synchronized skating competitions! Or even being somewhere in Europe where everything is a train ride away! We are 2 hours from Texas (drive) but even there we cannot just simply drive to compete because they don't do IJS Synchro. So we cannot really compete without spending crazy amounts of money to travel elsewhere. At least be as strong as our last competition and have a great comeback next season. Can you give us a clue about your theme(s) or music(s) for the next season? Team Mexico was present at Worlds a few years ago… When will the international public be able to see you again? ? Hopefully, the end of this year, beginning of next!